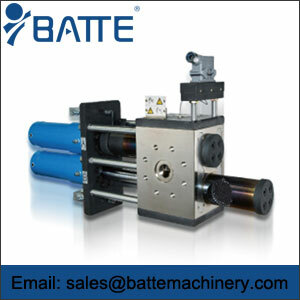 The most common is the hydraulic screen changer and the manual screen changer, followed by the piston non-stop screen changing device, the piston non-stop screen changing device of high cost, less in the domestic users, following a brief introduction to the hydraulic screen changer, manual screen changer. The filter and the production of hydraulic plate type exchanger for granulation, suitable for film blowing, blowing, the under water pelletizing, injection molding and other plastic production line, extrusion machine, plastic granulating machine, drawing machine, Lin Mo machine, rubber extruder, rubber filter machine, sheet machine, casting machine, laminating machine, blow molding machine, injection molding machine, sheet extrusion, sheet extrusion, hollow plate, Zhenzhu Mian foam and other various extruder. The exchanger is suitable for all kinds of high viscosity of plastics such as PE, PO, PP, EVA, PSA, PVC, PET, PMMA, PC, EPS, EPE, PP, POM, ABS, PS, PA, BOPP and other properties of different high viscosity plastic material.